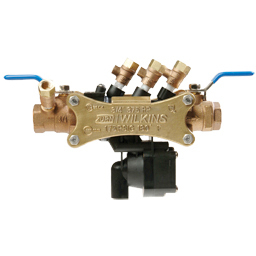 Zurn Wilkins: 375 Reduced Pressure Principle Backflow Preventer, 1/2" to 2"
Connection Size 1/2", 3/4", 1", 1-1/4", 1-1/2", 2"
Designed for installation on potable water lines to protect against both backsiphonage and backpressure of contaminated water into the potable water supply. The Model 375 provides protection where a potential health hazard exists. For information on Lead-Free* options, please refer to the Model 375XL product page. *The Model 375XL contains weighted average lead content less than 0.25% for wetted surfaces. For weights and other specific information please refer to the specification sheet in the download section.